The Findhorn is one of Scotland’s classic highland spate rivers. Finlay Wilson writing in the March edition of the Trout & Salmon magazine said ‘the Findhorn is the most stunning river he has ever fished’. One rod is available on every Wednesday from Wednesday 11 April to Wednesday 16 May, cost for the six weeks is £300 + VAT. One rod is available on every Thursday from Thursday 12 April to Thursday 17 May, cost for the six weeks is £144 + VAT. One rod available on every Friday from Friday 13 April to Friday 18 May, cost for the six weeks is £144 + VAT. One rod available on every Thursday from Thursday 25 May to Thursday 27 September, cost for the seventeen weeks is £425 + VAT. 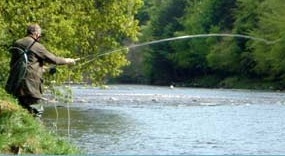 Two rods available on every Tuesday from Tuesday 22 May to Tuesday 31 July, cost for the eleven weeks is £550 + VAT. One rod available on every Wednesday from Wednesday 23 May to Wednesday 01 August, cost for the six weeks is £550 + VAT. The Darnaway Fishings comprise separately let beats predominantly on the left bank of the river from the top end of the Association Water to just below Daltulich Bridge.